By the time the United States got serious about looking beyond its own borders to conquer new lands much of the world had already been claimed. Only a few distant territories in Africa and Asia and remote islands in the Pacific remained free from imperial grasp. Hawaii was one such plum. Led by a hereditary monarch, the inhabitants of the kingdom prevailed as an independent state. American expansionists looked with greed on the strategically located islands and waited patiently to plan their move. Interest in Hawaii began in America as early as the 1820s, when New England missionaries tried in earnest to spread their faith. Since the 1840s, keeping European powers out of Hawaii became a principal foreign policy goal. Americans acquired a true foothold in Hawaii as a result of the sugar trade. The United States government provided generous terms to Hawaiian sugar growers, and after the Civil War, profits began to swell. 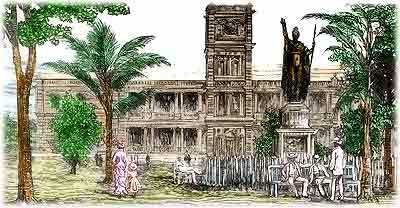 A turning point in U.S.-Hawaiian relations occurred in 1890, when Congress approved the McKinley Tariff, which raised import rates on foreign sugar. Hawaiian sugar planters were now being undersold in the American market, and as a result, a depression swept the islands. The sugar growers, mostly white Americans, knew that if Hawaii were to be annexed by the United States, the tariff problem would naturally disappear. At the same time, the Hawaiian throne was passed to Queen Liliuokalani, who determined that the root of Hawaii’s problems was foreign interference. A great showdown was about to unfold. 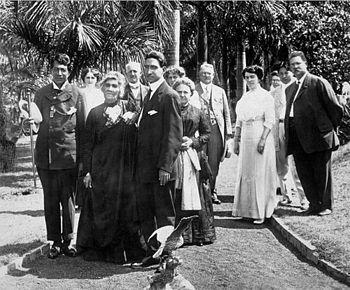 Queen Lili’uokalani with friends and her royal family. Copyright ©2008-2018 ushistory.org, owned by the Independence Hall Association in Philadelphia, founded 1942. This work by The Independence Hall Association is licensed under a Creative Commons Attribution 4.0 International License.